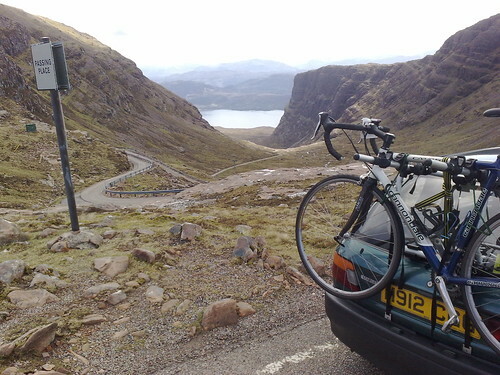 The Bealach Beag is a 43-mile mini cyclosportive run by Hands On Events in Wester Ross. It takes in the Bealach-na-ba road, (gaelic: Pass of the Cattle), which rises to 626m (2053 feet). It’s one of the highest roads in the UK, and a great place for a sportive. It has a great feel to it when you ride it on a bike- like an Alpine or Pyrenéen Tour de France climb. I entered the ride with a Mr Ian Wallace, who is training for the Étape de Tour in July, and four of his friends. Having ridden with him recently, I was aware of his strength on the climbs, and wanted to hold his wheel for as long as possible up the Bealach-na-ba. We set off promising to take it easy until the climb but as we warmed up, the pace kicked up as the excitement built. It was clear and sunny, with a brisk wind, but the top of the Bealach was clouded in mist. Rain began to fall after 30 minutes, and the bealach loomed nearer. I began to lose touch with Ian in the crowds of cyclists, but jumped on the wheel of a couple of fast riders who pulled me up the road, and I was safely with my mate for the start of the six mile climb. We ‘dibbed’ at the bottom of the climb, so our times would be recorded, and set off at as high a pace was sensible. By this point the original group of 6 had become 3. Ian and I took turns to pace up the climb, passing other riders all the way, and getting the occasional word of encouragement. As the road got steeper, and we passed more and more riders, I started to feel tired but I pictured Andy Schleck in the 2008 Tour de France on the Alpe d’Huez, with his head up, arms lightly on the bars, and the pedals rhythmically turning, and I pushed on, leading Ian and a couple of others who had tagged on behind us. My enthusiastic imagination perhaps did me a disservice as I faded further up the climb, and lost touch with Ian and the others we were riding with. But I ground the gears as the gradient got steeper, the rain heavier, and the mist thicker. I dibbed at the top of the climb and had got to the top, at it in 42:52, a minute or so behind Ian. The rain seemed to stop immediately and the sun came out as I began the descent. But my fingers numbed as my soaking gloves dried, and I was worried I would not be able to operate the brakes at speeds nearing 40mph. I wiggled the fingers to keep some circulation going, and sped downhill, passing cautious riders as I went. I was keen to catch Ian, and took in some fast corners without taking too many risks. The descent to Applecross was exhilirating, but a further rush of adrenaline helped me to prepare for the road back to Shieldaig as I swept through the village to a clapping crowd. As I got settled down, I could see the orange jacket of my buddy up the road and pushed the gears hard to try to catch him. Luckily it did not take me too long and we were able to spend several miles working together in a group in fine conditions. After around 10 miles our group was caught by two very fast riders whose presence upped the pace considerably. We sped along the rolling terrain until people began to be dropped from the back of the group. Ian worked hard to keep in touch but gradually lost them, and should maybe have dropped back to get the benefit of a mini-bunch, but he persevered on. I ground my way over the incessant rolling road to Shieldaig, spurred on by the anticipation of a good time. I knew Ian was only a minute ahead of me at most, and was keen to catch him. At one point I had him in my sights, at maybe only 10 seconds, but a car waiting at a ‘passing place’ on the single track road (ubiquitous in the Scottish Highlands) thwarted me and suddenly the gap was 30 seconds or more again. We pushed on to the finish and I was pretty chuffed when I saw the results – Ian and I finished 37th and 38th out of 458 riders. My overall time was 2:48:00, with Ian finishing in 2:47:34. On Sunday 10th, I drove up the Bealach-na-ba road to show my wife. The conditions were clear and warm- a shame we did not enjoy that on the Saturday! 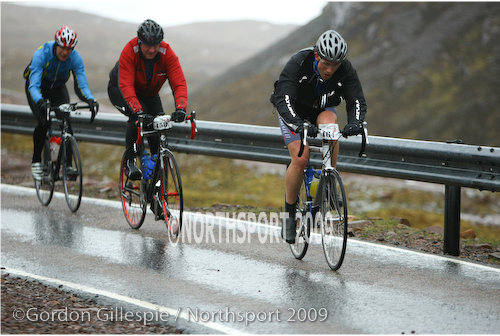 Next up, a century… maybe the Bealach Mor or the Cairngorm Century, also run by Hands On. 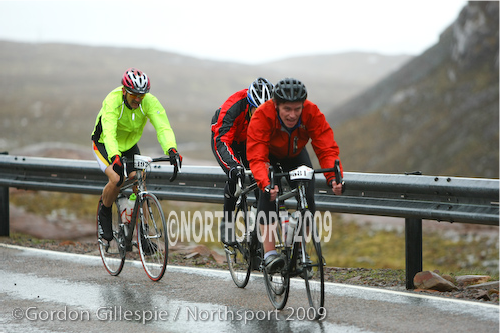 This entry was posted in Routes / Rides and tagged climbing, cyclosportive, Scotland on May 12, 2009 by Owen.